First Time at Vibe Ride? Here is what you need to know! Whether you are new to indoor cycling or just new to Vibe Ride, we are here to ensure that your first class is not your last! We understand group fitness can be intimidating; that’s why we pride ourselves on making your experience very comfortable from the moment you walk in. So before you jump in the saddle, let us give you a few tips! Please wear whatever makes you comfortable, we only ask that you don’t wear long pants that may get caught in the pedals! 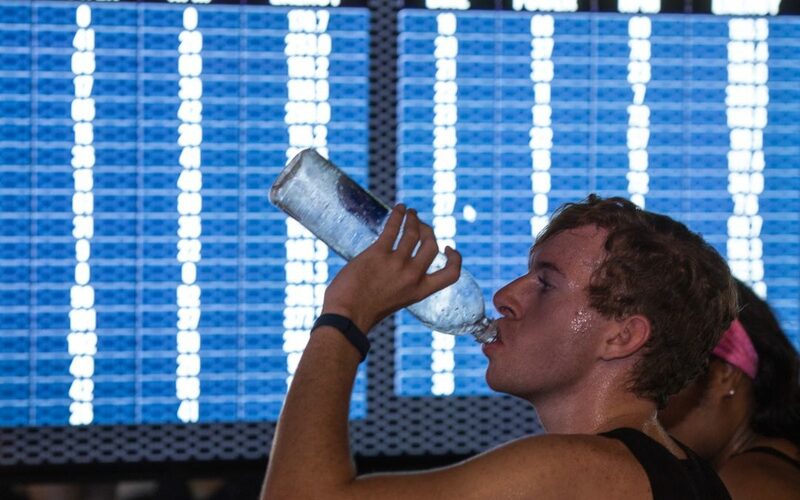 You will sweat, so we recommend dri-fit clothing and we also recommend that you bring plenty of water! Indoor cycling shoes are recommended (SPD clips only), but one of the nice things about Vibe Ride is that we offer you free shoes and a towel for your class. Free parking in Midtown? Yes, we provide that, too! Free parking is available in our attached garage. We have a convenient back entrance on level two next to Marlow’s Tavern and evolation yoga. You may enter the parking garage on 8th St or Peachtree Pl NW. Please note that if you come before 7am, one parking entrance may be closed, but others will be open. We also have a front entrance at 950 WPeachtree St NW. When you first walk in, make sure you head to our front desk to sign in for class. We’ll provide you with shoes, give you a tour and confirm your bike for class. Bike setup and form is key to a great ride. Our certified instructors will help you properly clip-in your shoes, adjust your seat and handlebars and instruct you about the features of our award-winning bikes! Remember, your seat height is very important and you want to be in a position where you can get proper knee extension to prevent injuries. We want you to take full advantage of our technology, so prior to your first ride, please create your My Stats account on our homepage. Once you arrive in our studio, our state of the art bikes are equipped with a Bluetooth wireless computer that not only measures and displays your power (in watts), speed, calories burned, and miles, but also shows the information transmitted from your heart rate monitor. Selected performance data is also transmitted to our Vibe Ride TVs in real time during class, so that you can compete as an individual or as a team. Now you are equipped with all the basics, so come on in, saddle-up and enjoy the ride!